Home > Magazine > Money, money, money! 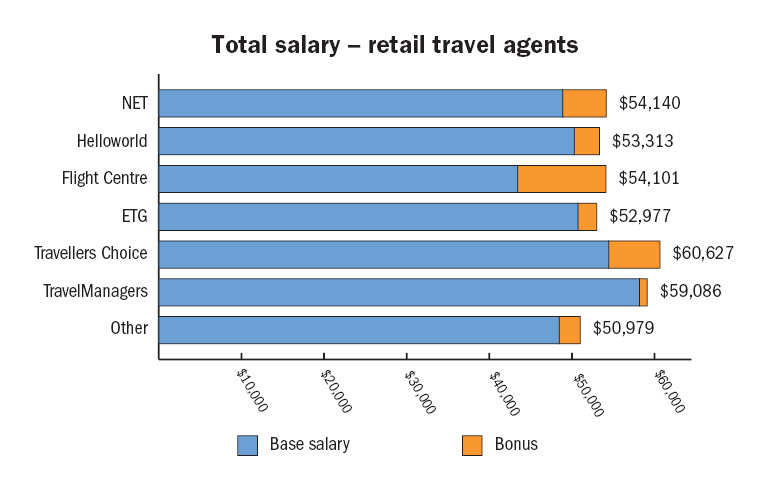 Does the income of retail travel agents vary depending on where they work? Which sectors of the industry provide the best outcomes for employees – both financial and lifestyle? The 2018 travelBulletin/Travel Daily industry salary survey has revealed some intriguing insights into pay rates, bonuses and job satisfaction. Bruce Piper unpacks the results. If you feel like you haven’t had a pay rise for a while, you’re not alone. Like the wider economy, there appears to have been little wage growth in the Australian travel industry over the last twelve months. The latest iteration of the Travel Daily/travelBulletin salary survey has revealed about half of respondents (49%) have not had a pay rise, and in fact the average salary has dropped slightly from last year’s figures. Conversely of course, the figures revealed that 46% of the industry are now earning more than this time in 2017, while just 5% have had a decrease. This year the survey garnered almost 1,300 responses from people working in retail, wholesale, aviation, corporate, cruise, MICE and travel technology companies. There was also a good mix of experience and seniority, as well as from both metropolitan and regional parts of Australia. As in previous years the survey highlighted differences between men and women, and once again demonstrated that those working in aviation, cruise and accommodation on average earned more than their counterparts in retail, wholesale and corporate travel. For the first time this year, the survey analysis has enabled a comparison of the income received by retail travel agents in different groups — and the results are fascinating, particularly given recent mainstream media coverage making allegations about Flight Centre’s working conditions, salaries and selling techniques. The figures confirm that out of all the agency groups, Flight Centre remuneration is much more skewed towards bonuses, with lower base salaries but potential for top achievers to earn much more. However on average, across all of the retail agency groups there was no statistically significant difference between the total income of consultants (including base salary and bonuses) regardless of where they worked. The average overall income for the 415 travel consultants who responded to the survey was $54,140, with Flight Centre agents reporting a total almost bang-on that average, with $54,101 in total income. Helloworld agents who responded earned $53,313 on average, while Express Travel Group consultants received $52,977. The Travellers Choice agents in the poll were slightly ahead at $60,627 on average, while TravelManagers earned $59,086. While there was some variation in these figures, the sample sizes meant there was no statistically significant difference between travel agent income by travel agent group, so it doesn’t really matter where you work when it comes to total income. However differences did appear between the groups when base salary was separated from bonuses. Flight Centre agent base salary was $43,413 on average, compared to $50,259 for Helloworld consultants, $50,714 for those at Express Travel Group and $54,436 for those working at Travellers Choice agencies. Flight Centre agents had the potential to earn much more — one respondent took home more than $100,000 — but of those from Flight Centre who responded to the survey, 42% said they had received no bonus at all in the last year. Of course, we also all want to be happy at work, and it was also interesting to note the “net promoter score” for retail agents based on where they worked. 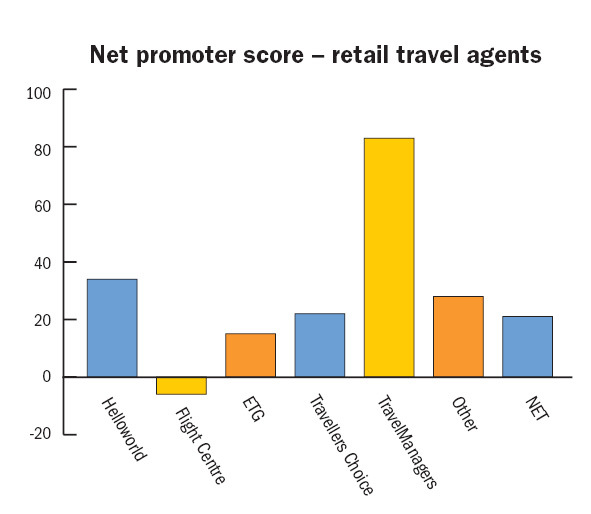 Agents at Helloworld, Express Travel Group, Travellers Choice, TravelManagers and other groups were significantly more likely to be a “promoter” of their employer than those who work at Flight Centre, and the converse was also true — more Flight Centre consultants who responded to the poll felt negatively about the company than those who worked in other parts of the travel industry. The survey once again highlighted the gender pay gap, with some interesting trends including the fact that the difference between what men and women were paid varied significantly depending on their seniority. Top female travel industry managers earned slightly less on average than their male counterparts, and the gap was also very small at entry levels of the industry where men and women are paid roughly the same. However when it came to middle management, the earnings gap between men and women was significantly bigger. And finally, the poll also demonstrated differences between the various sectors of the industry. Respondents who worked in aviation, cruise and accommodation earned about 25% more on average than those in retail and wholesale. But it’s not just about money, because retail consultants were among the happiest in their workplaces. In fact the figures showed that people in the travel industry generally feel pretty good about what they do, with the only sector showing a negative net promoter score being wholesale.